The ideal guitar to learn on, the Discovery Nylon has a comfortable 1 7/8th inch radiused neck. With its cutaway design you have access to all 20 frets. The Fishman electronics let you easily fits in with other players. The built-in tuner make staying in tune a breeze. We designed this guitar with a solid Engelmann spruce top. Engelmann is less dense than Sitka and will be more responsive on a nylon stringed guitar. The satin Bourbon burst finish is beautiful. 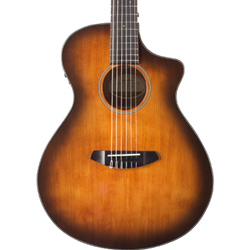 2018 Discovery Concert Satin Bourbon Nylon CE Specifications Body Type - Concert Neck Wood - Mahogany (Okoume) Solid Wood Top - Engelmann Spruce Back & Sides - Mahogany Top Finish - Natural Satin, Bourbon Burst Back & Side Finish - Natural Satin Fretboard - Ovangkol # Frets - 20 Nut Width - 1.875" Tuners Hardware - Nickel Nylon Open Gear Lower Bout Width - 15.37" Waist Width - 9" Upper Bout Width - 11.28" Body Length - 19.875" Body Depth - 3.75" (neck) 4.5" (tail) String Gauge - D'Addario EJ44 Pickup - Fishman T Bridge - Ovangkol Binding - Black Inlay - Centered dots Case - Standard gigbag Scale Length - 25.5" Sound Hole - 4"